Just added 2 new fields to the project resource at the VersionEye API. This is an example response. The 2 new fields are “public” and “private_scm”. “public” can be true or false and basically says if the project on VersionEye is private/public. If it is private, only the owner and the collaborators have read access to it. If it is public, everybody can see the dependencies and licenses of the project. Even random users who are not signed up at VersionEye! 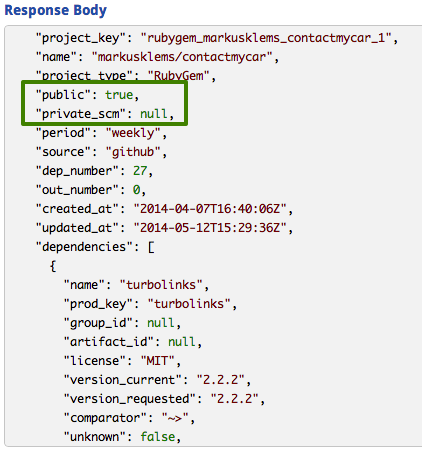 “private_scm” can be true, false or “null” and basically says if the SCM (Source Control Management) of the project is private or public. Possible SCMs are GitHub and Bitbucket. If the project was created via our GitHub/Bitbucket integration, this attributes tells you if the repo behind the project is private/public.